Finally, we get to part 3 (of 3) in our Effective Space Planning blog series and it is time to “take the plunge” on final decisions and see your dream become a reality! In parts 1 and 2 we discussed laying the ground work for the pre-design and worked through the design process. Now we will help you through the final steps and share with you how to prepare your new space for patients! Once your space design has been perfected to the exact look you want, your design team will compile a formal quote and approval drawings. Take your time to review all the documents they provide for you. They should include a list of your color selections, final dimensions of the fixtures, and a general layout of the space and how it will look. As we have mentioned multiple times, taking your time up front to review all information allows you to avoid costly mistakes and change orders in the future! Keep in mind, your design team should provide you with cost estimations for things outside of their scope. Things like shipping costs to move the products from their location to your new space, as well as sales tax. We include these charges in our formal quotes, but not all companies do so make sure you account for these additional fees. After you have given your design team the green light and submitted your down payments to get the project into production it is time for you to relax! That doesn’t mean you get to completely check out, but your level of involvement on the day to day will decrease. You still need to be available for questions and we recommend you communicate with your contractor on a regular basis to stay informed on the progress of the build out. It is important to also note…things may change (and that’s ok). Delays are not uncommon at this point in the process, and often the delays are out of the hands of your design team and contractor. The city can delay projects (due to permitting) or materials can be backordered from suppliers, there are a myriad of things that can change timelines. Don’t get discouraged if this happens and know that your teams will do everything they can to make sure the project runs smoothly and on time! Once your space has been built out and all the fixtures installed it’s time for you to put the finishing touches on! Prepare your space for frames and create the environment you want your customers to experience. A well done new or remodeled space can often lead to a 20% increase in your average selling price for eyewear, and great client experiences lead to success for your practice. Make sure to keep your frame displays organized and up to date; a clean, orderly, and well-arranged space is more conducive to sales. For our suggestions on how to set up your displays, check out Preparing Your Space for New Frames, Follow the Leader? Trends in the Industry, and The Sales Magic of Display. We also recommend having a grand opening (or reopening) to bring your community and patients together. Events like these are a great way to create a connection with your patients that extend beyond the exam room. Your patients will appreciate the time to mingle with other patients and see your new office! Once the build out/remodel is done it is important that you do not become complacent. It is vital that you stay up to date on your promotional materials and feature walls. Mixing things up and keeping your displays fresh will ensure your patients continue to be impressed and inspired when they visit your office. We hope our Effective Space Planning blog series has helped you feel more confident in your upcoming (or potential) design project! We are happy to answer any questions you may have and welcome you to reach out to us! In Part 1 (Laying the Groundwork and Setting Pre-Design Expectations) we discussed finding your dream team, creating a budget, and developing a realistic timeline to ensure your project is set up for success. In Part 2 we will be discussing the design process, realizing your vision for the space, and next steps. Picking the right space for your business is a key component of being successful! Do your research when considering certain spaces or cities. Location is key…think about finding a space where you can bring in new clients, satisfy already established clients, and grow your business (even if that isn’t in your plans- you never know where the future may take you). We recommend contacting local organizations in the cities you are considering, like City Hall or Chamber of Commerce. Organizations like these can provide you with answers to questions you have about the city, as well as share with you current listings of locations for rent/sale. It can also be a great opportunity to establish a relationship with key contacts at the city. We had a client who followed our advice and built a relationship with the Business Development group in their city, and through the relationship was able to avoid delays when issues arose in the permitting process for an existing space they were renovating. Once you have selected a space the real work begins. This is when you will begin working with your DREAM TEAM! As mentioned in Part 1 it is very important to pick a team you feel confident in! It is their job to help you develop your vision for the space. Starting the design process with brainstorming sessions and “pinning” is very important. Scrolling through images of spaces you like and don’t like will help you realize the look and feel you want to create for your business. Create boards on websites like Pinterest with all your ideas! If you don’t have Pinterest, no worries! Do a quick google search for “Optical Space Design” and see what pops up! Once you find a few spaces you like, take screenshots and show your design team! At this point in the design process no idea is a “bad idea”, the more ideas the better as it will help you narrow down exactly what it is you are looking for. After you have thoroughly browsed for ideas, the next step is to get picky and narrow down what you want for your space- this is the time to get serious. Think about things like theft deterrence (do you need it? ), the amount of storage you would like to have, how many frames you want to display, etc. Thinking about these things ahead of time will save you time and money as you narrow down the design. 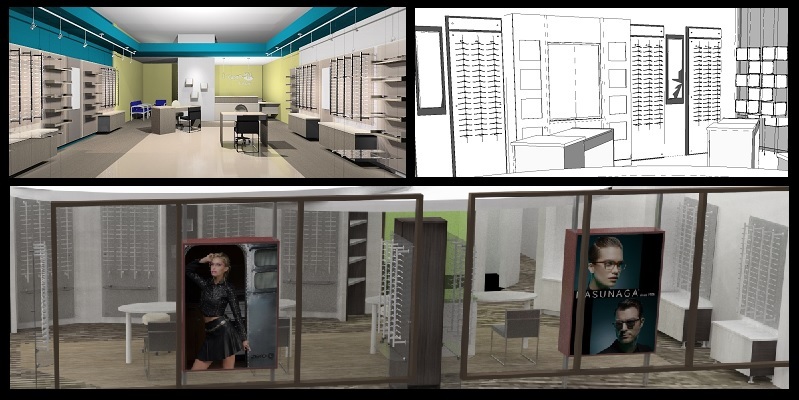 Optometry has changed in many ways over the last few years and perhaps the most important consideration to be given when designing a layout is the list of rooms you need to establish efficient process and business flow. Ask yourself things like… “How many exam lanes do I need?”, “Do I need to make special provisions for equipment?”, “How big of a break room does my staff need?”. [Not sure which questions to ask? Check out our Design Survey for a few ideas!] Thinking about these things before you start the layout process will help you establish a general process flow that your design team can expand on. A well thought out professional space can eliminate the need to move later if sales volumes increase beyond initial expectations. Once you have a general space layout, think about the dispensary (“sales”) environment you want to create. Keep in mind…a clean, neat, and well-arranged space is more conducive to sales. Do not try to overwhelm the space with too many frames. We could go on and on with advice on how to display frames, but for the sake of this post we will just include links to some of our other blog posts on the subject. – Follow the Leader? Trends in the Industry! Your design team should meet with you to evaluate your business needs then help you decide what the most efficient flow and design for the space will be. After the layout has been developed and your design direction has been solidified it is time for the project to begin “on paper”. Your design team will work with you to develop drawings of the space and you will begin to see your vision become a reality. But you aren’t done just yet…next you will need to satisfy the requirements of the municipality in which you are located and the building landlord’s conditions. Requirements often include building permits, which involve an architect’s stamp and submittal to the city. Not all projects need permits. Prior to beginning your design project, it is important to check with your landlord and/or contractor to see what all is required. Take a deep breath and don’t forget it’s about YOU! This all can seem a bit overwhelming…rely on your dream team- they will walk you through all the necessary steps to make sure your project is a success. As a design client it is easy to lose sight of the bigger picture. All this hard work will pay off in the end; you are opening a business/or remodeling an existing space and that is exciting! Don’t forget in the hustle and bustle of it all, this really is about you. Your design team is there to help you, the contractor is there to build the space for you, the owner of the business is you. – Be involved. It is important that you are very involved from the get-go. It may seem like a lot of time and energy up front, but it will pay off in the end. – Think about your budget. Be realistic, know your budget and stick to it! The team you work with should work within your budget to get you the look you want without compromising the budget you have set. There are many ways to make designs more cost effective. — Utilize panel layering– instead of a laminate panel with an added acrylic panel and frame supports just do an acrylic panel with frame supports, or perhaps just a laminate panel with frame supports. — Color selection/materials– choosing a “standard” color or a less expensive material can help with overall costs and often the change isn’t even noticeable! – Take your time. Taking extra time up front and not rushing through the steps can save you countless dollars once you start building. (Your New Office). – Stay organized. You don’t want to be the reason your project gets behind schedule. Make sure you set aside time to review drawings or communications from your design team and contractor. This is a very important part of the design process to ensure the team is building the exact space you want. Check back in for Part 3 to learn about taking the plunge and preparing your space for business! Don’t scare away your customers! October can be a bit “spooky”… whether it be because of Halloween, the change in weather, or the sudden realization that summer is officially over. We find ourselves being cooped up inside (especially for all of us in Seattle! ), which can often lead to serious evaluation of the environment where we spend most of our time…the office! Do you look at your space and think…that’s outdated, I should really change out that display, or why did I buy that extra line of frames? If the answer is yes, then it’s time to update your space before you scare away your customers! Ok, that’s a bit dramatic… but they will really appreciate the new look and feel of your space! New Signage: Adding signage can point your patients in the right direction, making it easier and more convenient to shop and find exactly what they are looking for! Mirrors: Mirrors are the perfect addition to any space. They help to open up the space, but also provide the perfect canvas for your customers to view your merchandise. New Dispensary Design: Creating a new space for your patients to shop and your employees to work creates an exciting and refreshed environment. Need help thinking outside the box? New Displays: Even just updating your frame boards can create the look of a new dispensary without having to redo everything and start from scratch! With the help of our new “Complete Systems” it is even easier to pick out a new look! New Accessories: Surprisingly, new space accessories (i.e. paint, flooring, seating, lighting, etc…) can make all the difference in the overall appearance of your space. Perhaps changing the color of your walls can create just the pop you were looking for! Changes, whether large or small, can make all the difference when it comes to the way you present your business and merchandise to your patients! And just think…now is the perfect time to make these changes as we start rolling into the busy holiday season! Author enncogrpPosted on October 23, 2017 December 14, 2017 Categories Business Advice, Design and Build, New ProductsTags BETTER STORE DESIGN, HAPPY CLIENT EXPERIENCES, INCREASE SALES, love your office, OPTICAL STORE DESIGN, PRESENTING MERCHANDISE, Remodel, SELL MORE, Space Design, STORE DESIGN, SUCCESSFUL DISPENSINGLeave a comment on Don’t scare away your customers! your services, and your professional image. Don’t throw a scarf into your dispensing showcase and call it “display.” That old scarf trick can literally make your frames disappear. 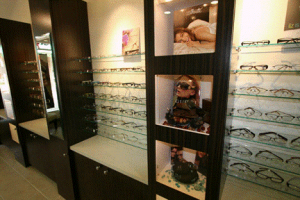 Display in a dispensary should have as its main impetus product definition, regardless of the cost, quality or quantity of frames in the showroom. A functioning display enhances the product directs and informs your clientele, and creates an entertaining and relaxing atmosphere in which to visit and shop. person to be responsible for the displays, and allow some time for general maintenance (five to eight minutes, end of day, to clean and reorganize the showroom). Schedule a comfortable and logical time for any major display changes. (It may have to be after business hours.) Make a display storage space where you can keep tools and materials and display-related paraphernalia: frameholders, seasonal trim, display risers, sign holders, and so on. You can re-use certain displays, or rotate them from one store to the other if you have more than one location. Have a file labeled “displays” where you can keep a list of your suppliers, save notes on display, and keep a record of your expenses (they are tax-deductible!). Plan your displays carefully. Concentrate on a theme that ties in with your total in-store marketing strategy. Your visual statement should coordinate with your current advertising and promotional program. The display should harmonize with your decor and company image. The featured merchandise must be available (check your inventory) and your staff should be knowledgeable about the merchandise advertised in your display. Your display should reflect the style and taste of your target clientele. If you are unfamiliar with their lifestyles, simply ask them what they feel about your display. They will appreciate your interest in their opinion; you will gain insight as to what appeals to your clients; and you can determine the effectiveness of your display work. Display is not difficult to do or undo. If your initial design doesn’t look right, simply adjust the “picture” by moving things around. Keep in mind that patience and practice will improve your skill and build up your confidence. A beginner should proceed one step at a time. Start with a small spot display instead of taking on a window display instead of taking on a window display as your first undertaking. Concentrate on one line of frames and build a setup with materials furnished by the manufactures. 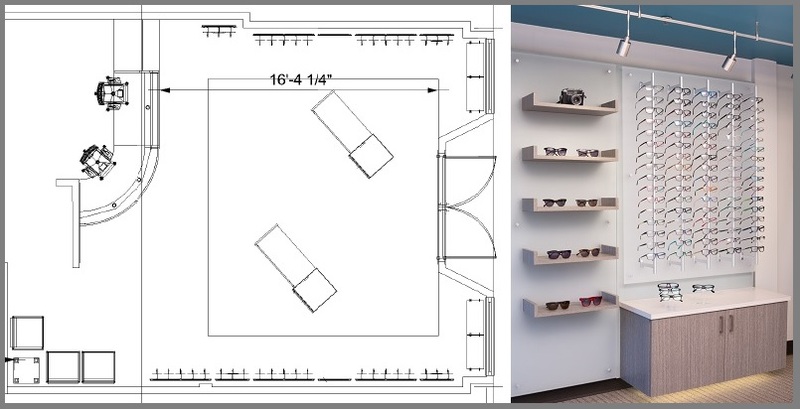 In fact, utilizing the posters, point-of-purchase displays, frame cases, and logo plaques designed by the eyewear manufacturer is one of the best ways to create a display where all the components coordinate and relate to the product. When you become more experienced, you may add ingredients to the frame display which are not purely optical, like a pair of driving gloves with some men’s sunglasses or that scarf with the women’s fashion frames, But whatever you use, make sure it coordinates with your frames in design, physical makeup, color, and character. Most importantly, do not upstage your frames with your displays. Keep in mind your objective: to project, enhance, and sell your merchandise-your frames, Eyewear is small, translucent, and finely detailed, and can be easily overwhelmed. if you remind yourself to “frame the frame,” that will help you control excess enthusiasm. When in doubt, keep it simple. You need not do artful display for every frame in the office. Placing frames in straight rows is acceptable. Group them according to gender, function, manufacturer, physical quality or price. Do spot displays where needed to highlight a grouping or to relieve monotony. 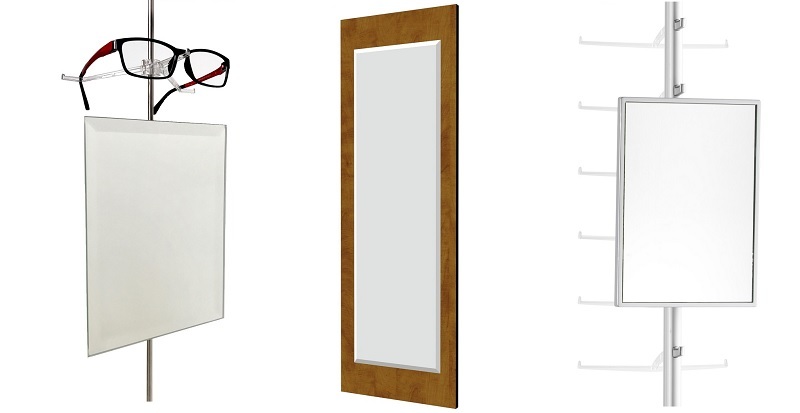 (Hint: use your newer frames for your display set-ups. It’s better to use frames with lenses as these are closer to the finished product your patient will receive. In addition, the lenses will reflect light and add sparkle to the display.) Avoid disturbing the display you spent time and effort designing. Have duplicates available to show your patients.